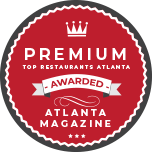 Thank you for your interest in Cuts Steakhouse in Atlanta, GA. Please contact us at 404.525.3399, today, to make a restaurant reservation and enjoy some of our authentic southern cuisine in Atlanta. We look forward to hearing from you soon. Monday - Thursday: 11:00 a.m. - 10:00 p.m.
Saturday: 4:00 p.m. - 11:00 p.m.
Sunday: 4:00 p.m. - 10:00 p.m. When you’re looking for great food, a vast selection of drinks, and the perfect atmosphere for conversation or celebration, make a reservation at our steakhouse in Atlanta, GA. We offer a menu full of Southern favorites like shrimp and grits, premium aged steaks, and an extensive wine list with a perfect selection for every dish. Whether you’re visiting us on date night with your significant other or you’re planning a special event or celebration, you’re sure to have a memorable and delicious dinner with us. Reach out today to make dinner reservations at our restaurant. When you’re celebrating a birthday, wedding, graduation, or anniversary, why not enjoy the day in true luxury by visiting our steakhouse in Atlanta? Located in the heart of downtown, we’re in a prime location if you’re staying at any of the nearby hotels, visiting popular attractions like the zoo or aquarium, or attending graduation ceremonies at the university. No matter what the occasion is, we make sure to provide a memorable dinner for all our guests. If you’re planning a group dinner at our location, be sure to get in touch with our event coordinator to make sure your dinner plans are carried out smoothly and timely. We make sure we have the space set aside for your guests and can even provide private or semi-private dining areas to make your special occasion even better. If you have more than 12 guests, it’s important to reach out to us to make sure we have enough room and wait staff to assist you. From small and intimate tables for two to large private dining rooms for groups of a dozen or more guests, we make sure to cater to your needs at our steakhouse. We even have an event coordinator dedicated to making sure every guest or group is pleased with their visit. When you choose to host your event with us, you can count on us to provide great food, stellar service, and a memorable experience for all. Get in touch with us to schedule birthdays, anniversaries, graduation celebrations, basic dinner reservations, and more at our steakhouse. 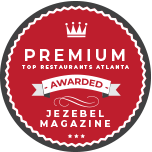 Contact us at 404.252.3399 to make a reservation or discuss your needs with our staff. We are proudly located in the heart of downtown Atlanta, Georgia.